Wow, this product is wonderful, I've tried other brands but they are either too big or rips out of the binders. This one doesnt. These dividers help me not just to stay organized, but they have helped me look great when others had to take a look at my material. I have several binders that I use these with for the current and prior year. After that they make a great transition to expandable folders for top tab dividers. The larger tabs allow me more space to print what I need on the tab. The printer friendly tab insert page allows me to print the info for my tabs vs. handwriting them..
Transcript: Welcome to MyBinding.com. These are the Avery Big 5-Tab Clear Dividers. These Avery dividers are perfect for any binder. Their 50% larger size makes for easy organization and quick navigation. This pack of five dividers comes with a sheet of perforated inserts. Simply handwrite them, or go Avery.com for printing templates. Tear along the perforations, fold in half, and insert into the specially made tabs. A sturdy reinforcing strip keeps the holes from tearing out when turning. They’re an all around practical and reliable design. Welcome to MyBinding.com. 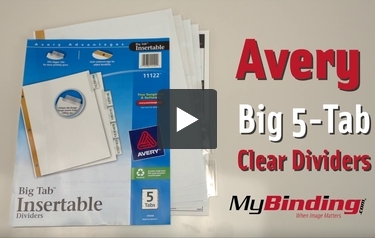 These are the Avery Big 5-Tab Clear Dividers.